"Love The Ones We Hurt"
Supergirl and Powerboy, oooh, kiss kiss in the sky outside Boomer's hospital window. Powerboy talks about how it's his mission in life to help Kara, who wants to go see Boomer now that he's awake, which makes Powerboy spout red electricity (and really, why wouldn't it?) and sends Kara crashing into Boomer's hospital room. Powerboy drags her off and beats her up some because Kara won't listen to him. Powerboy, you see, harnesses emotions and turns them into... red electricity (and really, why not?). Then the thorny-shouldered woman who hired the League of Assassins from last issue is sitting around a pool in the middle of Stonehenge, talking to some... blob in a pool of water. Then Faust appears for no given reason and asks if the thorny-shouldered woman is the one who wants to go to hell. Uh... 'kay. Then Powerboy's got Kara on a bed of rose petals in front of his WALL O' KARA and in "strength dampeners"... which Kara annihilates in seconds (tip: get a new strength inhibitor, Powerboy, because yours... aren't). Powerboy relates how he's from Apokolips and "felt" Kara when she was there and she was so beautiful, blah blah blah he had to come to Earth to be with her and he only hits her because he loves her, baby. She trashes his... airplane hangar in the desert (siiigh) and he ends up out in space with a Father Box, and Kara instantly shows up and Super-knees him to the groin. She crushes the Father Box and it starts glowing and Powerboy begs her to throw it into the sun, and she does, but before it gets there it... explodes? Maybe. Story - 3: Powerboy harnesses emotions and turns them into red electricity. Kara's been swooning over him for several issues now. Nothing from that? Really? Nothing from the people trying to kill her? Ain't that strange. It's almost like they just made up the power when they got to this issue. Ha ha. Don't be silly. That could never have happened. Boomer was horribly wounded and has feelings for Kara, and then she makes out with another guy while Boomer's trying to recover from being attacked by people who wanted to kill... Kara. My dear Kara, you get classier and classier by the moment. Have you not a single ounce of yourself that isn't completely self-centered? What became of Cassandra Cain? Supergirl's spiky spine (I am so depressed that I just wrote that line...) stabbed her and left her in a puddle of blood, and then they DON'T TELL US IF SHE SURVIVED? Of course, she's a fairly major character in the DCU so I don't expect she's dead, but my concern here is nor for Miss Cain. It's for what Kara did to her. Figuring no one expects Cassandra Cain is really dead does not give the book license to simply ignore this MAJOR STORY POINT and not only not tell us if Kara has killed or not, but not even have Kara WONDER if she's killed her or not. She doesn't think about it? Talk about it? OR EVEN MENTION IT? Is that A LOT OF CAPITAL LETTERS? Maybe, then, my anger comes across. This issue served mostly as an "abusive boyfriends are jerks!" parable, and while that is true enough, it was done in such a base manner that it felt like reading an issue the point of which was to tell me the sky was blue. Really? You don't say. Thanks for the help. Never would have guessed. Powerboy is devoid of any character or personality, which may be part of the point, but at this moment in time I really don't feel I can give Kelly that kind of credit as his track record on this book has been what I would say is "not filled with win". I was going to give this issue a two, but then I realized... hey, no lame, repetitive, redundant, reiterative, repeating, pleonastic, prolix flashbacks. See what I did there? I'm clever, I tell you. Anyway, those have become so despised in my mind that the mere lack of them warranted a rating boost of one point. Next issue promises to reveal all about Kara's past... yeah, and I've got a choice presidential suite on the moon to sell you. Regardless, if it ends the flashbacks permanently, I'm all for it. Art - 3: I believe this is Churchill's last book. Considering the second page of this book was a full-page splash of Supergirl and Powerboy kissing in four different stages, I say that can't come too soon. The art on this book has been as repetitive and monotonous as the flashbacks and... well, that says a lot, I think. Cover Art - 3: Well. Um. The tattered cape and the coloring are cool. 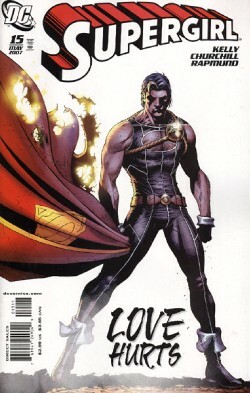 But the day when Powerboy warrants a solo cover of any book is a sad day in the DCU as far as I'm concerned.